Samsung’s Galaxy line has been a big hit since 2011. It has outperformed its rival iPhone in many markets around the world. 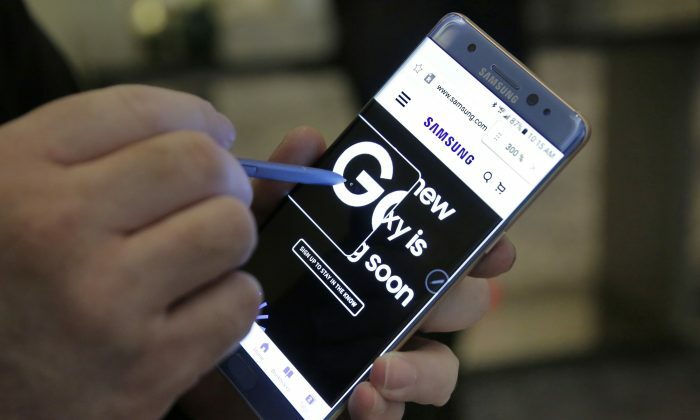 However, a series of issues with its Galaxy Note 7 has caused severe damage to its reputation, raising the question of whether Samsung can keep its market leadership. Samsung announced a recall of its flagship smartphone Note 7 in early September just a few weeks after its launch. The company said the issue stemmed from overheating batteries that caused phones to catch fire. The company blamed its battery supplier. Samsung recalled more than 2.5 million units and promised to replace the phones. However, the replacement devices caught fire too, which dealt a major blow to Samsung’s reputation. Samsung had to issue a second recall and ceased the production and sales of Note 7 on Oct. 11. The U.S. Department of Transportation banned Note 7 phones from all U.S. flights on Oct. 15 after a phone caught fire on a Southwest Airlines flight. The South Korean giant slashed its third-quarter operating profit estimate by more than 30 percent. The total operating costs related to the termination of Note 7 would be 6.1 trillion won ($5.4 billion) over the next nine months, according to the company’s estimates. The problem with the Note 7 will go beyond its costs and have a negative impact on the brand’s reputation, according to analysts. “Samsung needs to clarify causes of GN7 melting issues as early and clearly as possible to lower market concern of potential repeating issues before launching new flagship models like Galaxy S8 next year,” stated Citigroup analyst Henry Kim in a report. According to some experts, Samsung was too slow in handling the crisis, and this may have to do with the culture. “It is a South Korean company. It takes a good bit of time for a company that is headquartered in Seoul to respond appropriately to things in the United States,” said Gene Grabowski, a partner at Kglobal, a consulting firm based in Washington, DC. According to experts, the most important strategy for companies overcoming such a crisis is to be truthful. Although Samsung admitted the problems and halted the production of its Note 7, it failed to provide transparency related to the product fault. “Apple had similar problems with its iPhone 4 [due to its antenna design] in 2010. Steve Jobs held a Q&A session with reporters and answered every single question. He was very transparent,” Grabowski said. “Samsung is not that transparent. Samsung does not have the advantage of a dynamic leader who can answer all the questions,” he said. It is hard to estimate the scale of the damage to Samsung’s reputation. But analysts believe the next product, Galaxy S8, which may come out in early 2017, can help repair the brand image. “Although it is premature to gauge if there could be any major damage to [Samsung’s] brand value, we continue to think product quality and consumer feedback on Galaxy S8 … will be important for [Samsung] to maintain its brand value,” stated Goldman Sachs analyst Marcus Shin in a report. “Samsung still has an excellent reputation. We do not expect to see the same kind of precipitous decline [in reputation] as we saw in Volkswagen where there was a corporate wrongdoing. With Samsung, it is just a product fault,” said Stephen Hahn-Griffiths, a managing director at Reputation Institute, a research and advisory firm for reputation. Samsung ranked third on the list of America’s most reputable companies in March, according to Reputation Institute. “Samsung has built up an enormous amount of goodwill in brand equity,” Fladung said. Samsung users are loyal to their phones and its Android operating system, according to him. Hence, he does not expect a big migration from Samsung to other brands. “Majority of people who returned their Note 7 got Samsung Galaxy S7 Edge. There were only a few people who switched to iPhone,” said Doway Rivera, a Verizon store manager in Manhattan, New York. The Note 7 is considered the main rival to Apple’s new iPhone 7 model, and so Samsung’s troubles can be a boon for Apple, especially during the upcoming holiday season. Samsung is expected to lose some market share to the iPhone as well as to Google’s new premium Pixel smartphone. Samsung led the smartphone market with 22 percent unit market share in the second quarter of 2016 and Apple came second with 12 percent share, according to IDC, a market intelligence firm. “We studied Samsung for many years, and they would tend to do the right things. Therefore, we would expect the reputation to recover after taking a short-term decline,” Hahn-Griffiths said. Samsung can even come out of it with a stronger reputation if it can handle the crisis well, he said.